File - Poodle eating food while standing on road. 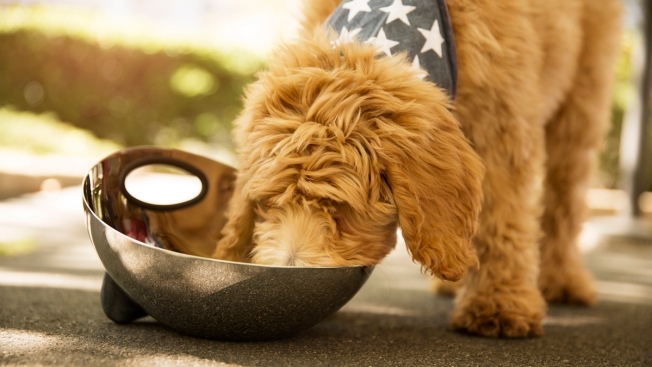 Hill's Pet Nutrition is expanding its nationwide recall of canned dog food due to elevated levels of vitamin D.
Hill's Pet Nutrition recalled canned dog food for excessive vitamin D last last month. Customers responded to Hill's Facebook post with claims their dogs have become sick or have died after having eaten the food. Company has not yet responded to a request for comment. Hill's Pet Nutrition announced Wednesday it is expanding its recall of canned dog food due to potentially elevated levels of vitamin D.
The company issued a voluntary recall on Jan. 31 of 25 varieties of Hill's Prescription Diet and Hill's Science Diet canned foods, due to the same concern. It is now saying eight more products and several additional lot codes of previously recalled varieties have been affected by the same vitamin premix that was the source of the original recall, according to The Food and Drug Administration. Hill's said the issue was isolated to the vitamin premix from a U.S. supplier used in its canned dog foods and limited to specific production lots. Elevated levels of vitamin D which could lead to health issues, including vomiting, loss of appetite, increased thirst, increased urination, excessive drooling and weight loss, according to the FDA. When vitamin D is consumed at very high levels it can lead to serious health issues in dogs including renal dysfunction. The FDA urged pet parents with dogs who have consumed any of the recalled products or is showing any of these signs to contact their veterinarian immediately. Hill’s has received a limited number of complaints of pet illness related to the expanded recalled products. The affected canned dog foods were distributed through retail pet stores and veterinary clinics nationwide. The company said no dry foods, cats foods or pet treats were affected. A full list of the recalled foods is available here. After the initial recall, Hill's faced a backlash from pet owners who felt that company was slow to communicate the issue with customers. Pet owners took to the company's Facebook page alleging their dog had either become sick or died after being fed the canned food that was later recalled. At the time, Hill's said it was "heartbroken" about the situation and "working with pet parents to listen to their concerns." "As pet parents ourselves, we understand the gravity of health issues with our pets. We have extended our call center hours and tripled the number of people on our phones, so we can take time with every pet parent. Additionally, our team of veterinary professionals is engaged with vet hospitals and clinics to respond to their questions," the statement said. Customers who purchased the product with the specific lot/date codes listed should discontinue feeding and dispose of those products immediately or return unopened product to your retailer for a refund. For more information, please contact Hill's via their website or at 1-800-445-5777.